Having been a part of WICC for almost eight years, and a recent addition to the World Day of Prayer International Committee, I have always sought to counter injustice, examine intersections of privilege, and work towards peace and reconciliation. My Master’s research provided a space to meld these objectives with formal studies. By recreating a history of the 1930s St. Catharines Orioles, drawing attention to their story, and joining discussions of other histories that have been overlooked or ignored in their modern telling’s, my work seeks to disrupt narratives of Canada as a virtuous and faultless place and draw attention to histories that exist outside of the white stream narrative. 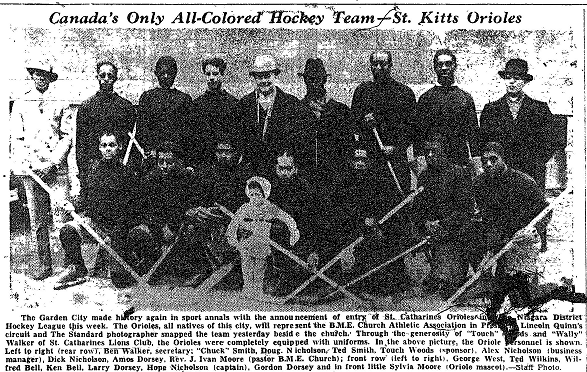 The St. Catharines Orioles was the first all-black hockey team in Ontario and played in the Niagara District Hockey League in the 1930s. The history of the Orioles, like many other African-Canadian hockey histories, such as the Coloured Hockey League of the Maritimes (1890s-1920s) has been overlooked, erased, and ignored. My recent Master’s research addressed how this erasure is indicative of broader sociological issues of race and racism as the historic exclusion and (non) remembering of non-white athletes contributes to our understanding of sport history in the present. Neglecting to include athletes of colour in the mainstream history of sport contributes to the whitewashing of Canadian sport history. A large portion of my research involved archival work in the 1937 and 1938 issues of the St. Catharines Standard, which allowed me to develop a history of the Orioles, as it would have been known during the 1930s. After developing this history, I examined how the Orioles have been racialized and excluded from sports history in the present. I then analysed two book as secondary sources, The Sports History of St. Catharines (McNabb & Meighan, 1969) and St. Catharines: Canada’s Canal City (Jackson & Wilson, 1992), as I identified when and how non-white individuals were included in histories and considered what this means for our understanding of sport in the present. 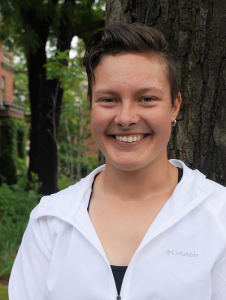 Through my research, I learned much about the articulations of race and sport and gained a deeper understanding of ways that whiteness has pushed the experiences of black athletes to the footnotes of whitewashed sporting histories. I experienced every emotion between excitement at finding articles to anger and frustration at the abundance of racism that I have been faced with in the newspapers and in discussing my research with others. I wrestled with my position as a white female researcher examining racism and prejudice without direct experience. I struggled through countless explanations when (white) people asked, “why does a black hockey team from the 1930s even matter now?” In an era when white supremacist groups are resurfacing, and racism and sexism are overtly encouraged by prominent politicians, my research has never been more current. Using Canada’s national sport as a prime example of the perpetuation of white, heterosexual, male privilege, the absence of black Canadians from hockey history further prolongs the practice of whiteness and normalcy of racial privilege. The title spells the city’s name with an e. The correct spelling is St. Catharines. Thank you Joan for noticing the spelling error and letting us know. We have corrected the spelling of St. Catharines in the title.